Don't just read and lurk---tell us more! Do you want to share one of your adventures with us? Click on the "CONTACT US" link at the bottom of the Navigation bar at left, and send us an email. With your permission, we'll post it here so that others can read it! I read the account of your Emigrant Wilderness trip with great interest. My wife and I made our first foray into Emigrant this summer in the last week of July, about three weeks after your trip. (Three years ago we did the Leavitt Meadows to Hetch Hetchy hike just a week after you did. Just a coincidence. We're not checking up on your reports.) We've done several other trips over the past five years, mostly in Hoover and the northern reaches of Yosemite, and I mean five- to seven-night treks, so we sort of know what we're doing, but our ability to do it is diminishing year by year. We both just turned 69, so things are getting harder physically, particularly for my wife. We decided to do a point-to-point hike this year. My brilliant idea this year was to start out from the Leavitt Meadows pack station on horseback and have them take us up to Helen Lake. That way we would avoid about 2000 feet of climbing and have just an easy jaunt from there over Dorothy Lake Pass. We had ridden once before, about twenty years prior, in Colorado, and remembered it as fun and easy. This was different. The trail was much rougher, made much more so by the fact that our stirrups were adjusted too long (which we realized far too late) and that our horses were clearly not happy about being on the trail. After about three hours it wasn't fun any more. After about six hours we were in agony and could hardly stand up when we dismounted. We told the young wranglers we would walk the rest of the way to the lake, which we did -- somewhat painfully, but it was better than riding. At least we had already made most of the elevation gain on horseback, but that's really the only good thing about the day. We camped that night at Helen Lake, which we had all to ourselves except for about a billion mosquitos. We ate dinner in the tent. So we would not recommend a "backpacker drop," at least not for inexperienced riders. It wasn't cheap either. The next day we were over Dorothy Lake Pass quickly (no mosquitos once we hit the trail) and then more slowly over Bond Pass to enter the Emigrant Wilderness. We camped that night somewhere above Cherry Creek, a couple of miles upstream from the junction to Huckleberry Lake. Once again, the mosquitos made life absolutely miserable, and for the first time ever we had to use our mosquito head nets. The next morning, as we hiked down the Cherry Creek trail to the junction, we were again beset by clouds of mosquitos. (It can be really fun to try keeping the little bastards off you while your hands are stuck in hiking pole straps. To avoid injury, you have to keep your distance to stay out of the way of flailing poles. At some point you begin to wonder why you ever thought this was a good idea.) The situation was made worse by the fact that the trail, as you noted, seems to be an old road on which someone has dumped an infinite number of softball-sized rocks. We didn't hike the same section of trail that you did as we were above the junction, but the condition of the trail is apparently the same both above and below. Our theory is that this "road" was once used for driving cattle up Cherry Creek to summer grazing in Summit Meadow where we had seen a couple of old cabins. Anyway, it was not a good morning. The trail up from the junction to Blackbird Lake was very challenging for my wife. The temperature must have been about 85, and she doesn't do well with heat. The combination of heat with a steep climb in the middle of the day made things pretty difficult; but we did make it to Emigrant Lake by late afternoon. It was magnificent, and there were hardly any mosquitos where we camped at the east end. There was only one other party at that lake that night, which was nice. The next day was very hot once again, which was not nice. The remainder of our trek followed the same trail that you took -- past Deer Lake, Whitesides Meadow, etc. The whole trip took us seven days, six nights on the trail. The last two days were half-days as we decided to spend one relaxing afternoon at Chewing Gum Lake and hike out to the trailhead the next morning. Things that might interest you, if you're still reading: (1) As terrible as the mosquitos had been for the first two nights (and one morning), they were no problem at all thereafter. Things apparently dried out considerably in the three weeks between your trip and our trip, so things were fine as long as we were down below about 9000 feet. (2) It was just too damn hot pretty much every day. We've never experienced temperatures so high at those altitudes. Several people we met on the trail said the same thing -- never seen a summer this hot in the Sierras before. Not good if you don't enjoy hiking in the heat, and we don't. (3) Dry, dry, dry. We had no fords at all. Nothing that we couldn't just step through. In fact, we found that finding water was a serious problem. One person told us that the only way to hike Emigrant in late summer is lake to lake. Who knew? We've never encountered this problem in Hoover or Yosemite. No water other than standing pools in Salt Lick Meadow. Just the tiniest trickle at Whitesides Meadow. No water to speak of in upper Cherry Creek, although we did find a usable trickle in a tiny tributary. (4) No crowds once you get away from the trailhead. Three nights out of six we were absolutely alone, and two others we had only one or two neighbors. This is in part because we sometimes didn't camp at a lake; but we didn't see that many people on the trial until we got to Chewing Gum Lake. It was the weekend, and Chewing Gum was a mob scene, but still pleasant enough. It was astonishing how many vehicles there were at Gianelli. Apparently most of those people were hanging out at lakes that we had bypassed. (5) At some point you just can't do this any more. My wife is a gamer, but her strength and endurance aren't getting any better as we get older, and with the high heat she had a very hard time. We were struggling to do just five or six miles a day. Moving slowly, taking lots of breaks. I'm still doing fine, but I think she's done with backpacking, which breaks my heart. We can still do day hikes (and just finished eight wonderful days of day hikes in the Canadian Rockies), but I think backpacking together has come to an end. So either I quit, too, or I go by myself, which is not nearly as much fun. I tend to get lonely and bored. So enjoy it to the fullest while you can. The day will come when you (or, sadly, one or the other of you) just can't do it any more. Or not. We met a guy in Salt Lick Meadow who was 83. He wasn't doing very well, but he was out there. And we have a suggestion for you. Our last trip took us into the Caribou Wilderness east of Lassen over Labor Day. You'd think that we would have met thousands of people, but it was closer to about thirty over the three days of our trip, even during Labor Day. More importantly, the hiking was a breeze. The whole area is between 6500 and 7000 feet in elevation, so there are no long climbs to tackle. And there are lakes everywhere--literally about one lake per mile of the 23 miles we hiked! While we hiked 6 miles a day, you could have easily hiked three miles a day and still had a nice selection of campsites. Thanks for this note and the kind words for our site. We know how you feel about the early season. We just hiked in the Carson -Iceberg Wilderness last weekend, and we ran into snow at around 7000 feet. Pine Creek is further South, and so the snow levels are higher, but the problem is still the same. By August you should be fine. P swears by Elk Hair Caddis flies as a great staple for the Sierra. Hope to see you out there! Thank you so much for your website that chronicles the adventures of M & P! I read it a few times a month as we plan out our next hikes. We have a new hike coming up for us and we were hoping we could bounce some ideas off of you two, please? I'm interested in getting a pack for no more than 3-day hikes. I am reading the site and I know there are many options when it comes to packs buying. What are you thinking when it comes to L amount? I was thinking in the 50-60 range but I have only hiked and camped on one night trips in the Emigrant. The old rule about pack size is simple: get all your equipment together and then find the smallest pack that can carry all that stuff. What has to fit? Your sleeping bag and pad, tent, stove, clothes, and food. We can fit our gear for a week in a 50l pack, but there are two of us. M takes the stove and dishes, I take the tent and food. And we each carry our own clothes, sleeping bag and pad. If your sleeping bag doesn't compress as much as ours, or your pad is larger, or your cook kit is bigger, then you'll need a bigger pack. In winter, you'll need a bigger pack to carry heavier clothes, more food, and a heavier and bigger tent. And if you don't hike in the Sierra where you need a bear canister, or don't use a tent, then you can get with a smaller and lighter pack. That definitely helps tremendously! Thank you so much; I was reading through your "10" essentials to have in your pack I already had all of them. The only other thing I do not have that I want to consider investing in were the Crocs. I never even thought about clipping them to the outside of my pack, brilliant! >> Which of the Wilderness areas do you and M prefer the best? Thinking ahead for other future hikes. I have read a few things and I am very excited about reading more. Your blog means alot to me and I am glad I found it. I will comment more in the future. We are headed to Onion Campground and Mammoth Lakes in a few weeks. My goal is to hike the JMT, a part at a time. My biggest problem is my wife not understanding why I want to do this. She enjoys the outdoors but not as much as me. She thinks there is an axe murderer behind every tree and a bear waiting to attack. She is afraid of everything. (We have been married 8 years with 30 year age diff) The reason she is afraid is that I was shot in a robbery in Panama in 2008 and she distrusts the world where I am the opposite. Anyway on to the the Sierra Nevada this summer. I looked the Social Security website and my life expectancy is 17.5 years . My wifes is 53 years. I am having trouble convincing my wife why I want to hike the SN and JMT while I still can. She doesn't understand why I want to expose us to danger. Go figure. Anyway I want to say your site is very refreshing and nice to see what you have written. Hiking and camping to me is the fountain of youth. My wife doesn't understand that. She is from Colombia and I was born and raised in Eugene. Way different cultures. I am retired and she is starting school in the fall. I just ask her for 4 months of the year for my stuff and she can have 8 months. It will work out cause I don't give up or quit. Thanks for this note, and for the kinds words about our blog. We're always happy to hear from people who are reading it! We know it's hard for some people to understand just how beautiful the mountains are, and how peaceful they can be. John Muir used to say they were 'sublime;' meaning so beautiful that they make you think of God. That's a pretty great recommendation---and we know that we always feel not only physically better after we hike, but also much happier and at peace. And we don't feel that way after a movie, church, or a spa treatment! By the way, there is all sorts of scientific evidence that hiking in the outdoors is really good for you, both physically and mentally--it improves your physical condition, and makes you happier and healthier, no question. I don't know if you've read all of our website (there's a lot of stuff there!) but two things immediately come to mind. The first is our article about danger in the mountains. It's true, that bad things can happen to you hiking in the Sierra--but that is so much less likely than something bad happening to you in your bathtub, your town, or on the highway! So Lilly, we hope that you will give it a try. The first time that P took M backpacking, we went to a quite stream only about five mile in from the trailhead. It was a simple, quiet three-day trip, where we hiked in one day, spent the second day relaxing along the stream and taking life easy, and then hiking back out the third day. Nothing too strenuous, and we picked a spot where there were no other people for miles. We didn't see anyone for three days. On the drive home from that trip, M confessed that she had really enjoyed it far more than she expected: the peace and quiet, the beauty, and the quality time together. In fact, she admitted that she'd love to do it again. We spent one day at home washing our clothes, and then immediately left the next day for another backpacking trip--which was even better! It's now the thing we enjoy doing the most together. We're not saying that will happen with you, but we hope at least you'll give it a try--because maybe that's exactly how you'll feel! Wow what an awesome trip we had to Paradise Lake in Castle Peak Wilderness last weekend Sept. 19-22. Thursday was gorgeous, sun no wind nice 10 mile hike from I-80 trailhead near boreal ridge. Friday now the wind started to blow but wasn't to bad, caught 3 rainbows 12-13" nice fire to cook them on. By 7-8 pm the wind really started to pick up 30-40 mph, by midnight 50- 60 mph. We were wandering if we were going to make it through the night. At 6 am the rain started, made coffee under my vestibule, and waited for it to slow down, at 11:30 the rain hadn't slowed so we decided to bug out after some in the group were soaking wet. We had the 10 miles to trail head but if left soon we could make it by 4:30-5 with light to spare. Well soon the snow started to fly and I remembered the Peter Grub hut, if we could make it there we would be fine for the night. At 2:30 pm and walking through 3-4" of snow we made it to the hut. Found our way into the back door followed by two PCT hikers Jordan from Jackson Hole and Louis from France. We fired up the two wood stoves and were soon warm and drying out our soaked gear. We shared our food with them and had an awesome night playing Pictionary and sharing stories while 8" of snow piled up outside. 8 am was gorgeous outside sunshine, no clouds, we were out of the cabin and on the PCT toward I-80 3.5 miles. After some trailblazing because the trail was hard to find at times we made it to the trailhead and departed ways with the hikers. We had a most wonderful hike 4 days 24 miles horrible weather part of the time, but the guys I took with me, my nephew, and a cousin of my daughter in law said this was the greatest hike they and I have been on. Great experience for all of us. Thought I would share our experience with you. Still enjoy your blog and check it daily for something new. Sounds like you had a wonderful trip---and with some really good people. And it goes to show how quickly the weather can change up in the Sierra. Glad it all turned out well! Love the blog--thanks for all of the help. I have a couple of quick questions for a Desolation Wilderness trip I am taking this upcoming weekend. It is for 4 days and 3 nights. In your section on clothes, you don't appear to take any rain protection for your legs, like rain pants. I had planned to take my Golite rain pants (7+ ounces), but would love to ditch the weight. The weather looks good at this point, but I understand thunder storms roll through even in good weather patterns. Do your nylon pants shed rain reasonably well and/or dry out quickly? I will be wearing my nylon convertibles. Similarly, do you think this late in the year I need 2 insulating layers, or can I get away with either a fleece or an ultralight down jacket? My hooded fleece weighs 9+ ounces and my hooded down anorak weighs 8+ ounces, and I would rather not bring both. I am not worried about sleeping comfort, as I have a free standing tent and a 15 degree down bag. Thanks in advance for your advice! This will be my second trip. 1. The weather report. If it really calls for heavy rain, we usually stay at home. We'v certainly seen our share of showers on the trail, but not extended downpours. 2. When those showers come, they are usually in the afternoon. Since we hit the trail early, and plan to be in camp by about 2 or 3, we can get the tent set up and hide inside if it starts to shower in the afternoon. M always takes her fleece, a rainshell, and a down vest. She uses the vest as part of her pillow at night, and she often puts it on early in the morning before we hit the trail. Once we start hiking, she warms up, and quickly sheds the down vest. P, on the other hand, doesn't take anything more than the fleece and rainshell. If it is really cold in camp, we can always get into our sleeping bags. And on the trail, P generates enough warmth that he usually hikes in only his shirt--even on pretty cold mornings. He figures that within ten minutes on the trail, he will heat up and make the fleece unnecessary. Of course, your mileage may vary--but that's how we do it! 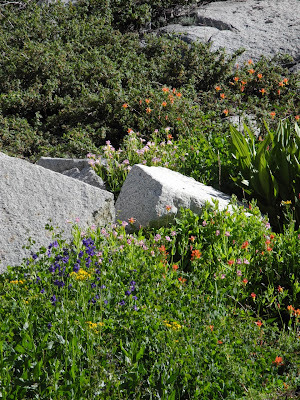 Hello, Just stumbled onto your site looking for some new hikes in the Sierra. You have done a great job and I enjoy the commentary. My wife and I hike/backpack mostly between Tahoe and Hwy 4. We still try to take the youngest grandkid (10) as he is not way too cool to hang out with grandparents. A few decades ago my pack weighed over 60lbs. Now I carry between 25 and 30 depending on… The biggest change I’ve made of late is shedding 30 lbs off my body. I hope to have 20 more gone by hiking season. Keep up the good work. Thanks for the note...we know exactly what you mean about losing some weight. Somehow, it's easier to pay another $100 for a sleeping bag that weighs one pound less...than it is to lose a few pounds around the middle! What do you recommend for the bear canister? Are there outfitters out in the park where maybe I could rent one or two for the time I am there. Or do you think that I should just buy them? We bought a Bearvault to use on our trips...and we are happy with it. But when you go to the wilderness office to get your permit, they will ask you if you have a bear canister. If you don't they will rent you one very cheaply---about $5, as we recall. And in Yosemite they use the Garcia version. If I were you, I would do that first....then decide if you want to buy one. The Bearvault cost about $60 or so. We like it because it is clear, which helps you find things, and it doesn't need a coin to open. The Garcia is a proven design that uses a quarter (or screwdriver, or the back of a knifeblade) to open it. One thing is important---these bear cans are not that large. Make sure your food compresses well so that it will fit. If any of the packages have air in them...poke a hole to let the air out, We always re-package our freeze-dried dinners in zip-lock bags, because they take up less room. The bear cans are not a lot larger than a 1/2 gallon juice pitcher, so that's a good way to start. Don't forget that you have to put toothpaste and other aromatic toiletries in the bear can too! Repackage those into smaller containers if you can. Day one--breakfast at the trailhead, lunch and dinner in your pack...to eat during the day. Day two--breakfast, lunch and dinner in the bear can. Day three--breakfast (and maybe lunch) in the bear can. Dinner at the trailhead or on the drive home. Conceivably, you only need four meals to fit in the bear can for the three-day trip! it and have found it incredibly useful and helpful. backpacking/fishing this coming season. My wife may join us as well. lake, and the like. And then hopefully go longer from there. I know we need a bear canister, and I am trying to figure out which one to buy. going for one, maybe two nights at a time? Thanks for this note, and for the kind words. We use a Beavault 450 for shorter trips, and we can squeeze enough food in there for 2-3 days for the two of us. But we only used it about three times before we went out and bought the larger 500, which has enough room for five days' food for the two of us. We like the fact that you can see through the sides, so it's a bit easier to find things in the Bearvault, and you don't need a coin to open it...but all of the various types work well. Yosemite National Park has rented the Garcias for many years now. For three people, you will want the larger size. Remember that you don't have to pack your first day's lunch or dinner into the bear can, because you are going to eat that before you need to store your food overnight. That means you just need breakfast and your lunch for the second day. Thats easy to fit in anything. But a second or third night out adds all three meals to the can. And if you like that area of Leavitt Meadows, we did a lovely trip that took us up to Fremont Lake the first night, Cinko Lake the second night and then up Long Valley for the third night. It was a lot of hiking, but the area around Cinko Lake up to Dorothy Lake is really lovely. And fun fishing! My friend and I are in our mid teens and are avid hikers, and we’re really interested in taking our hiking to the next level and take a backpacking trip. Your site has been invaluable in the planning for this (Thank you so much!) however, we’re a bit lost on where to go. We live in the Napa area, and really want to hike the sierras. As a first trip, we think we should limit our trek to 2 or 3 nights. If you have any suggestions on places to go that would be fantastic! We LOVE fishing, so hopefully that helps narrow down the choices for places to go. Thanks for the note, and for the kind words. Since you're in Napa, we are going to suggest a couple of options that are relatively close, so that you don't have to spend most of your time driving to there. 1. Grouse Ridge, off of Highway 20 just before it connects with Interstate 80 on the way to Donner Summit. This is a great location, because you start at the fire lookout on Grouse Ridge, and from there you can see at least five lakes. There are more than twenty in total. Hike down to the first lake, Milk Lake, which is only about two miles in. Then explore this area for the next couple of days...and when your packs are empty, make the climb back out to Grouse Ridge. The road to the fire lookout is dirt...but we've seen people do it in a 1985 Thunderbird....so it's not too bad! Fishing in these lakes is good for brown, rainbows and brooks. 3. Emigrant Wilderness, off Highway 108. Take the Highway 4 cutoff between I5 and 99, and then head up 108 towards Sonora Pass. If you like stream fishing, then take the Clark Fork Road, and hike up pass the Iceberg to Clark Fork...or up Disaster Creek. Both have good fishing, and the further up you go, the better the fishing---at least until you get into the high country, where there fish are smaller. P has caught trout at least 12 inches long in each of these spots...and they are all beautiful and not killer hikes. If you want solitude, Clark Fork is probably the least visited. Thanks so much for the great info. A buddy of mine asked me to go backpacking with him a few months ago. I hadn't done this since I was about 7 or 8(43 now). Other than the obvious, backpack, sleeping bag, tent, I had no idea what all I needed. Another friend referred me to your site and I read and read. I admire your approach to the outdoors and your approach to acquiring your gear. I loved the idea of "the lighter the better". I bought a good but fairly inexpensive "Golite" backpack and a good sleeping bag. Most everything else I bought used or found at the thrift stores. I had a lot of fun just acquiring the gear. I was amazed at all the goodies I got at thrift stores and garage sales. I found a good "thermarest" pad at a garage sale for 20 bucks. (retails for 70) I made a makeshift mess kit from an old light pot I found at a thrift store. The pot fit in a plastic bowl from home, my stove fit in a plastic cup with a sponge, which fit inside the pot. An oversize lid fit over the pot and tight to the bowl. I held it together with a rubber band. It worked great. I paid a dollar for the pot and the rest I had around the house minus the 24 dollar stove. Our trip was August 16th to the 18th. 3 days two nights. We started at Onion Valley above Independence CA. on the Kearsarge Pass trail. We hiked over the pass and down to Charlotte lake the first day(9 miles). The next day we kept our camp there and day hiked over Glenn Pass to Rae Lakes on the John Muir Trail and then back over in the afternoon. A grueling six mile day. Then hiked back out the third day(another 9 m). We had a trip of a lifetime!! An awesome awesome time. I honestly don't think I would of had as good of time or had been as prepared as I was without your info and insight. One of the the highlights of the trip was coming back to camp, slipping on the crocs, and heating up some miso soup. My Japanese friend thought it was funny that the "American guy" brought the miso. My pack weight was about 26 pounds. My initial weight was about 30. It felt heavy to me so I went through my pack and was able to shave about 5 pounds(mostly clothes and food). I threw in the crocs and had a net gain or net loss of 4 pounds. We passed many people with huge packs on that looked like they were about to keel over at any moment. Didn't look like they were having fun to me. I broke my back about a year and a half ago so weight was a huge concern for me. Thanks again for the insight! The back held up just fine. What a wonderful note--you absolutely made our day with this email. Thanks for writing...and let us know about your next trip! Just a note to say that I love your site and blog. You guys inspire me. I am feeling my years these days but I know I need to get out more. Last trip was with the Boy Scouts from Agnew Meadows to Tuolome Meadow two summers ago. (I kept sneaking the heavy stuff into the older boys' backpacks). I am going with my teenaged daughter in July for a short trip to Penner Lake in the Grouse Ridge Area (thanks for your tip). One benefit of age though -- I walked the Machu Pichu trail in 1974 ( or something like that) from Kilometer 82 to Machu Pichu and saw no one, just my girl friend and I making our way to the city. It was amazing the way the paving got better and better as we approached Machu Pichu. Even the ruins had only a few people walking around. A friend of mine spent a night there by himself. I was lucky too to spend lots of time in the Sierra when I was younger and there were many fewer people. I would go days without seeing a soul. I love the way you keep the blog current. Its always a pleasant surprise to check out the site and see a new post. Your cabin looks fantastic! On backpacking foods: Good backpacking information. I find that the $1.00 Knorr Pasta Sides, such as Alfredo, works good for me on the trail. In addition, the .50 cents Knorr “tomato Based Pasta soup mix,” from Wal-Mart is very filling. I never buy the expensive and bulky freeze-dried foods. These Pasta Sides are small and fit easily in a bear can. Do know a good blog that shows updated snow levels for the Sierra’s? Yosemite’s web is always out of date. Kings Canyon web trail conditions is better but still weeks behind in information. In June, it is hard to plan a trip without adequate trial information. It appeas that this year will be better than last year for the high country. By the way instead of a book, I take my Ipod, with recorded books, most from the library. If you want a non-fiction history audio books, I can sent you a list of titles for sharing. It will last about 3 days, on the trail, with a small backup batter charger will extend it for days. This is my one luxery item. We know Knorr well--P used their sauce and soup mixes 40 years ago as a staple part of our backpacking menu! The only challenge with the pastas is that they do require slightly more fuel to cook....but we agree--they are a great alternative. We've taken to dehydrating a lot of our own food, and that makes a real difference as well. I don't think there is a regular blog that covers the whole Sierra and it's snow conditions. But what I've read says that snow is now only prevalent above 9,000 feet,. and even then only on the North slopes. So many roads and trailheads are open right now that we're beginning to think it's more like mid-July than early June. But, of course, it could always snow again! BTW, I now have a Kindle, and we are going to take it on our next trip. It holds enough books for the two of us for a long trip, and the battery is good for at least a week! I am really enjoying your blog. I found it while trying to figure out day trips for this summer. It is very kind of you to provide so much information to people. I have looked at your suggestions for day trips, trips by nearby highway, and your Mono Creek trip, but am still having difficulties figuring out where to go. Do you have any suggestions for day hikes beyond those listed that you can share? As a flat lander from Ohio, I'm looking for vistas in the Sierra National Forest area that are less crowded. I am coming to judge sheep at the California State Fair in July. 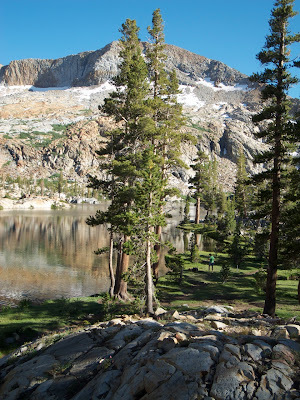 I have a friend who has a cabin I can use for three days in Central Camp just west of Bass Lake near Shuteye Peak. I thought the Kaiser Pass area might be a good choice, but perhaps there are also good options off the Sierra Vista Scenic Byway which is even closer to the cabin. I'm flying into Reno and will cross either Ebbetts pass or Tioga Pass, but will have limited time there on the drive across to Central Camp. What do you feel are the most awe inspiring vistas in these areas? My wife and I do not hike much. We are in our mid 50's and she has had knee replacements. Steep downhills are hard on her knees, so we bike normally, but aren't going to try to bring bikes on this trip. For a trip this short it makes sense to leave the camping gear we have for mountain bike trips at home and just day hike. Any suggestions you have time to share would be appreciated. We will also visit a friend at the Plumas NF and have a day to hike there so if you know of a must see view there please let us know. Last year we spent a month in Utah on the bikes. If you ever hike in Utah, and don't mind maybe sharing the trail with a horse or a mtb rider, the Grandview Trail in the Dixie NF is 78 miles along the edge of the Pansaugant Plateau from Red Canyon to Bryce with overlooks of the Sunset Cliffs and the Grand Staircase. Thank you for any suggestions you might have time to share. Thanks for the note, and for the kind words! It's always nice to know there is someone out there reading! One thing to keep in mind about your trip is that those narrow roads (Kaiser Pass, Beasore, etc) are very slow. I would suggest estimating about 15 miles and hour on them...which means it takes a full hour to drive from Shaver Lake to Lake Thomas Edison, for example. That can really cut into your hiking time! Having said that, there are some nice hikes in that area, but I worry about your knees. None of this terrain is flat, and you are almost always either climbing or descending on the trail. And while we might consider a nine-mile hike as a nice day-hike, I suspect that you would find that a bit taxing. And if you are really uncomfortable, it's no fun at all. We did a hike this last summer that left from the Granite Creek trailhead off Beasore Road, and climbed up to the Niche and then to Cora Lakes. That's about four miles, and then you'd have to return. There are some nice views, but it's also a bit of climb up to the Niche. And there is a trail (an old 4WD road) up to Shuteye Peak that has great views, but I bet your rental car won't make it, and the road is pretty steep. And there are some easier trails in the Bass Lake area...one focuses on the Mono Indians and how they lived...that's an easy one mile trail. And for flat walking, you can't beat the Brown's Ditch Trail, which follows the water flume for about 3 miles, and has some good views over the Central Valley, but not the High Sierra. One more thought, which is that the Sierra National Forest is really very helpful, and staffed by both rangers and volunteers who know that area a lot better than we do. We always stop to ask for advice, and they always deliver. I would give them a call and pose your question to them! I will also put in a good word for the Madera County VIsitors Center, which has a USFS office there from April through October. They were extremely helpful the last time we were there, and two of three of the staff all joined in with recommendations and advice. I've really been enjoying y'all's blog, and I had a question about next fall. We were thinking about tacking a trip onto one of my husband's work trips back to Cali, and I wasn't sure whether the drought situation in Cali was projected to continue and if so whether that would make backpacking difficult next fall. Any ideas on that? Also, looking at your first aid kit I thought I might offer one suggestion (which you may well have considered and rejected), but I started carrying quickclot. Heaven forbid we actually need something like that, but I figured that if copious amounts of blood were flowing anything to help stop that would be a boon. Thanks for the note and the kind words. We'll look into your first aid suggestion. We're always happy to get new ideas. As for the the weather and water between now and August...forecasts this week are calling for up to ten FEET of snow, although that is more in the southern Sierra than in the North. So it's still an open question. Even if we continue to be short of water, there are still trips that would work. And if you are willing to carry a few more water bottles, anything is possible. Fall is usually the perfect time to backpack in the Sierra, as the weather is mild, the crowds are gone, and the mosquitoes are waiting for spring!. Hi guys love your blog and have been browsing heaps. I was reading your comment about maybe in a hammock and that it might be a problem if you have a bad back because of the curve. Let me put your mind at ease please. In my case I have a chronic back problem and find the proper camping hammocks just, well awesome, I cant sleep on the ground in a tent my back is that bad. DD hammocks and the like are wonderful to sleep in and can take all the weather you can throw at them all while gently being rocked to sleep and once again I can go camping. Im now 43 (cough)ish with a dodgy ankle dodgy knee and a dodgy back to boot, thanks to hammocks im in heaven while in the bush. Thanks. Jeff! The next time we see a hammock hanging around, we'll try to take it for a spin! ...Unable to miss the whole hiking season due to injury, I just completed a nice 51 mile loop iin the Carson-Iceberg Wilderness using the TYT heading South, and returning North via the PCT. I wrote about this trip and the many fine PCT-TYT loops that you can carve out of the Carson-Iceberg in a Trip Report. If you have not explored this Wilderness in depth, now is the time to start thinking about next year's hiking. The Carson-Iceberg deserves your attention. I have put up a new Fall Weather page for backpackers. This page offers a wide range of resources including forecasts, maps, radar, satellite, ground-reporting stations, and even road conditions. If you have additional resources you'd like to see there, let me know. In due time. Right now I'm putting together the videos and guide pages for the Ebbetts Pass to Sonora Pass section of the PCT. It's in draft form, so if you have any information that you want incorporated into the guide, contact me. As usual, each trail guide page connects to a forum for that particular location on the trail, so comments can always be appended through the forum. The new pages start at Ebbetts Pass, and continue South to Sonora Pass. I'm currently building the videos for this section before I fill in the detailed maps, mileages, and trail descriptions. It's a work in progress that you may find interesting even now. Well, I'm swamped and I've got to get back to work. I hope you are doing well, and I look forward to seeing your trip reports on TW. Keep up the good work. Alex! We really like to read the trip reports---and are delighted that you post ours as a part of your site. Glad to hear you are feeling a bit better..and hope to see you out on the trail! Did you get any more good trips in this year? Such a short season! And if you like that, you'll enjoy some of the subsequent stories about meeting people, fish etc on the trail! Above Ottaway Lake .....August 26 ..stunning and no bugs !! Ottaway Lake, one of the prettiest places I have ever been! The flora was in FULL BLOOM everywhere !!! I can't thank you enough........ thank you. WOW! What great photos! And what a great trip! We look forward to seeing you out on the trail....and keep these trip reports coming! 5 clear blue sky days with perfect temps and swimming every day. What could be better. Next time we plan , we'll certainly council you. Thanks for writing back to us, guys! These kinds of notes really make our day! I keep coming back to your site for ideas - I'm thinking of planning the Ottaway Lake trip with my daughter but the red basin/devils punchbowl looks really inviting. This is one of my favorite sites and I keep on visiting it - Thanks so much for all of the work putting it together. Thank YOU, JG, for the note and the kind words. And please let us know if there is anything you'd like to see here....and we'll do our best to keep them coming! had hoped. It was an easy trip in, 3-400 elevation gain, but only 3 miles . and mine in 15 years. How cool is that? Hope that is the first of many great trips, Mark! 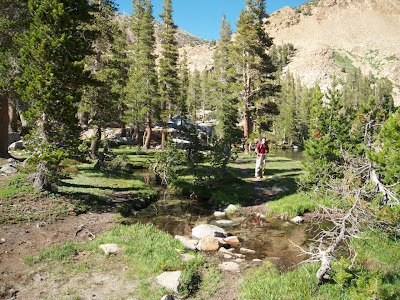 Hey M&P: Just returned from a great hike in the Emigrant Wilderness. There is still some snow at the higher elevations that obscures some of the trails and the mosquitoes are a bit of a bother but the Emigrant is still awesome. Left from the Crab Tree trailhead and made our first stop at Granite Lake, which required some off trail hiking. Then to Toe Jam Lake, Wire Lakes. overland to Leighton and Resasco lakes and then to Louse Canyon and Cherry Creek before coming out at Crab Tree. 37 Miles with about 18 miles of off trail. Never shared a lake with anyone. Conditions much like mid June. That's one of our favorite areas! We spent four days there last summer, and didn't see a sould for three of them! And permits are a piece of cake--simply stop in at the Pinecrest Lake Summit Ranger Station, and ask for one... And the topography is simple enough that it is pretty easy to get around, even off trail. Wanted to tell you that we took your advice and scheduled our first backpacking trip as a family to Youngs Lakes. It was a spectacular experience. Thank you for your inspiration and the pragmatic approach to this wonderful form of travel, on your website. The only thing we would change is to stay longer and perhaps go in August when the bugs are not quite so plentiful. I backpacked once as a teen and my husband and son have never backpacked, nor had our friends (without a guide). We were two middle aged couples and three boys (20/18/11) – one bad back, one bad knee and we all had a fabulous time largely because we had your site to guide us. We packed light, got the right equipment, and enjoyed simple but delicious meals. ...Our next trip is the Channel Islands in a few weeks. Our backpacks are ready and it will be a simple exercise to finish off the food prep and take the boat to our island wilderness. What a great note! We love hearing from our readers about their adventures--especially when they turn out this well! Wow Paul! I am glad that I found you...My name is David Hubbard, I was born in Yosemite while my Dad was Chief Park Naturalist there. It is different from all others since it is built and written from the perspective of an NPS family living in the Park. It has taken on a life of it's own. it seems. a hiking site, but I do think that we compliment what you have done. Thanks DH! Your site looks like a lot of fun--and we plan to explore it more over the next few days. Since P's father was also a ranger (State Parks only) when he was a kid, he knows a bit about the "backstage" part of parks....and how interesting those stories can be! Hi I got back from the trip with the kids. The kids stayed at Lane Lake for two nights. They love to swim and catch crawdads. They had a very good time. I can't believe how warm the water is. I ventured forth into Freemont Lake and got lost into Piute Meadows. Man the mosquitoes were out for blood over there. Crossing the creek to Freemont Lake was very easy. Much of the water receded. After the hiking trip I took the kids to Traventine hotsprings during the day. Not the best time to soak in hot water but fun nevertheless. Thanks again for all your help. That's Great KD! Glad you and the kids had such a great time. And it's good to know that some of those creeks are beginning to calm down a bit. We're going to get a first hand look at some of those in about ten days! Just a note to say thanks for taking the time to create your website. I spent a couple hours today browsing through it and taking a lot of mental notes and I really enjoyed it. I'm an avid camper and hiker and just decided to take the next step and start backpacking. My first trip is in two weeks and I'm so excited. I've been trying to collect as much practical info as possible and I found your site be very informative. I have my first destination planned, but I saw some interesting gems on your site that I may try in the future! Thanks again! Thanks Laurie. And we want to hear all about your trip when you get back---including some photos! You'll have a wonderful time! I had to tell you guys that y'all are very informative! I really like the cross country images of your adventure between Meiss Lake and Round Lake on picassa. Excellent. The above is on a trail guide page, the below on a backpacker's forum page. 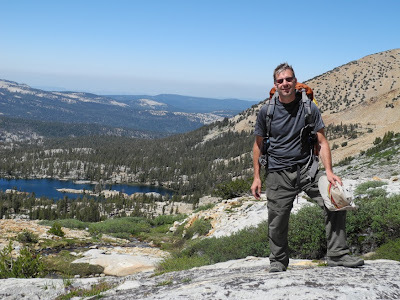 Here's my long term plan: I've got to get you guys to post your excellent descriptions, excellent pictures, and excellent analysis of your various explorations and trips in proper posts on my forums as I build them down the Sierra Crest. Hey, comments are OK, but they will not put your content on the top of their own pages, nor will comments find themselves permenantly listed in the Forums. Forum Posts Will. Don't get me wrong, I appreciate the comments. But most of your "comments" fully deserve their own topic in the Forum for that part of the trail. I have only got a bit of the North Sierras built in the Forums so far, covering the main trails from Meeks Bay to Highway Four. And you guys have lots of experience in this part of the Sierras! I would certainly reciprocate! But your site is not set up for contributions. So I can only offer links back to your site. 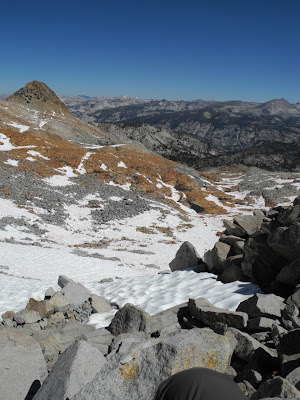 You guys have experiences that will deepen my site considerably in its objective (describing the crest trails) and widen it across the Sierra flanks as well. I will in turn link to your stuff from all of our topics that overlap (about all of them) and provide twice as many links back to your site as the number of your posts you put on my site. As you can see, your information goes into the trail guide too...and I would link the guide to your stand-alone forum pages, rather than back to comments!! I am in no hurry. It's a longer trip from Lake Tahoe to Mount Whitney on the internet than on the trail itself. I'll eventually get your links in front of every serious visitor to my guide and forums as they grow. PS: Put better pictures of yourselves on your site. I really liked the one with eyes closed and the camera at arm's length next to the Wilderness Boundary sign. Awesome! Thanks Alex! We think your site is great, as well! Let's work on this together and get more people out on the trails into the mountains! As for those photos....hmmm. We seem to take great photos of everyone except ourselves! But we have put up a page of photos near the end of the Nav bar....for those who really can't get enough of us!